This page opens the fifth section of a history of the Spanish conquest of the Americas, General History of the Deeds of the Castilians… (in Spanish, Historia general de los hechos de los castellanos en las isles y tierra firme del mar oceano), published between 1601 and 1615. Offering an official view of past events, the history was written by Antonio de Herrera y Tordesillas, who was appointed by the Spanish king to write a chronicle, or history, of Spain’s overseas colonies. Herrera’s interest in the pre-Hispanic past is visually cued in the 13 roundels arranged along the sides and the top of the engraving. Set against a background of curling vegetal forms, each exhibits an image of a pre-Hispanic Inka king. The portraits of the Inka rulers surround the book's title plate. The figure at top is identified as Ayar Manco Capac, “King of Cuzco.” According to accounts written after the Spanish conquest, Manco Capac was the son of the sun. After emerging from a sacred cave, he founded the Inka imperial dynasty. He faces the second Inka, his son Sinchi Roca (spelled Cinchiaroca here). Like all of the Inka kings in this engraving, Sinchi Roca wears elaborate ear spools and a head-band with a small fringed square over his forehead, the mascapaycha. This Inka insignia was reserved for the supreme leader of the empire, the Sapa Inka. In some ethnohistoric accounts, the Inka king shown fourth down in the left column, Pachacutic Yupanqui, is credited with establishing the layout of the Inka capital city of Cuzco and building the Korikancha. 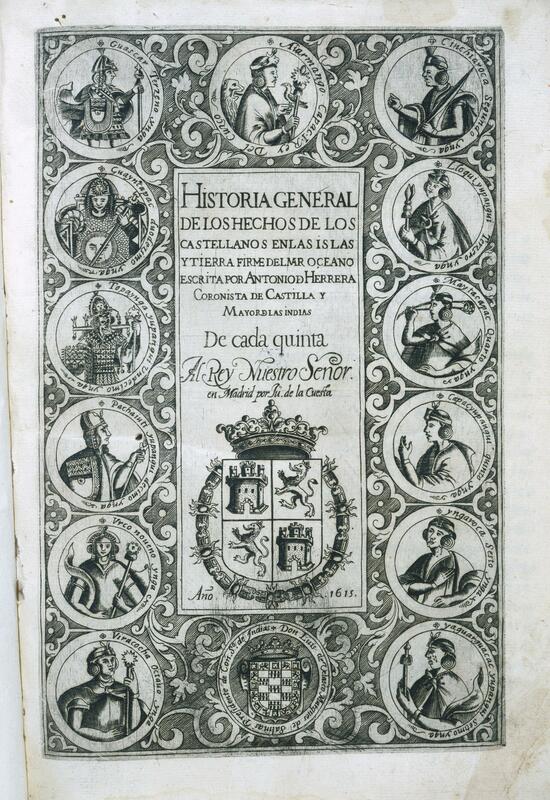 The text at center includes the name of the author, Antonio de Herrera, his patron, the king of Spain, and his publisher, Juan de la Cuesta. Displayed prominently below the text is the coat of arms of Castile and León, the two Spanish states that claimed, and officially ruled over Spanish America. Below it, the president of the Council of the Indies, who oversaw the administration Spain’s overseas empire, is represented by his coat-of-arms. 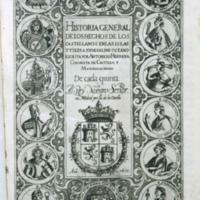 Antonio de Herrera had a royal appointment to serve as official chronicler of the Indies. His work was sponsored by the Council of the Indies, which also published the General History. The engraving was made by another hand, that of Juan Peyrou. This engraving draws its inspiration from images of Inka kings sent to Spain in the late 16th century. Most of the images in Herrera’s books are maps or works derived from European sources. In contrast, this one has a more complex, trans-Atlantic history: it is a European-made engraving based upon an indigenous painting created in Cuzco; this indigenous original drew upon both local, Inka iconography and European portraits imported into Perú, but was ultimately intended for Spanish viewers. Antonio de Herrera’s General History of the Deeds of the Castilians… (in Spanish, Historia general de los hechos de los castellanos en las isles y tierra firme del mar oceano), covers the years 1492 to 1554, from Columbus’ “discovery” through the conquest of Peru. In so doing, it forged a history of the Spanish conquest that sought to be comprehensive. While the vast majority of Antonio de Herrera’s book is text, each main section opens with images framing a central title. The pre-Hispanic Inka had a long tradition of honoring deceased kings and of keeping records of their deeds. In many regards, the imagery here holds true to this iconography of Inka rulership. Nevertheless, these Inka kings owe more to European-style portraiture rather than any pre-Hispanic mode of representing royalty. The very idea of a portrait, which showed individual rulers in profile or three-quarters view, was a Spanish introduction to the Andes. As one current scholar, Tom Cummins, has suggested, the Inka kings seen here trace a complex set of colonial interactions. Inka iconography was first translated into the visual language of European royalty by a native Andean painter. These images were sent from Cuzco to Spain. Then, Herrera and his engraver, “translated” the indigenous images into engravings appropriate for a book on the Spanish conquest. Ballesteros Gaibrois, Manuel. 1973. “Antonio de Herrera, 1549-1625.” In Handbook of Middle American Indians, vol. 13. Howard Cline, ed. Pp. 240-255. Austin: University of Texas Press. Cummins, Tom. 1994. “De Bry and Herrera: “Aguas Negras” or the Hundred Years War Over an Image of America.” In Arte, Historia e Identidad en América: Visiones Comparativas. G. Curiel, R. González Mello, J. Gutiérrez Haces, eds. Pp. 17-31. Mexico City: Universidad Nacional Autonóma de México. Cummins, Tom. 1994. “Representation in the Sixteenth Century and the Colonial Image of the Inka.” In Writing without Words: Alternative Literacies in Mesoamerica and the Andes. E. H. Boone and W. D. Mignolo, eds. Pp. 188-219. Durham: Duke University Press.